Hillary's lifelong pal seems destined to be one of tonight's DNC highlights. An event like the DNC is filled with human interest moments. From the podium, before each night’s marquee speakers, there will be smaller-scale speeches and stories that take hold. Omaha World-Herald reporter Joseph Morton sets the stage for one Tuesday night’s such moments, in today’s paper. 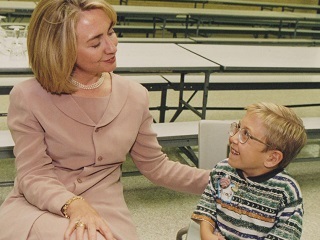 At the top of the front page, above, is a 1994 photo of Hillary Clinton with Ryan Moore, 7 at the time. Moore will give a three-minute speech tonight, ahead of featured speaker Bill Clinton, about his lifelong friendship with Hillary and the value of a health care system that does not disqualify applicants for pre-existing conditions. Over the years, Clinton and Moore would have many more interactions. Clinton met with him on a visit to Sioux City, Iowa, during her husband’s re-election effort in 1996, and then again the following week at then-Sen. Tom Harkin’s steak fry. When he had a big surgery in Baltimore in 1997, the family first stopped by the White House, where Clinton gave them an 90-minute tour and they were able to see the president as well. Clinton presented Ryan with a signed, enlarged photo of her holding him at that 1994 press conference. Moore currently works in the technology department of the South Sioux City Community Schools.